Description: Our farm’s focus is raising registered Barbados Blackbelly Sheep and Heritage Breed pork, including the curly-haired Mangalitsa. BB meat is mild-flavored and tender with less fat than wooled breeds. Mangalitsa pork is considered by many to be the ‘Kobe of Pork’ and is a red meat with beautiful marbeling. 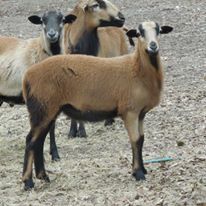 We produce lamb, pork, chicken, beef, duck and eggs; all raised naturally on pesticide/herbicide-free pastures. We have a store on the farm with our products and carry Happy Cow Creamery’s butter and cheese and other locally produced and natural products. We have a picnic area, hiking trails and welcome field trips. Check the calendar on our website for farmers’ market locations.